When you review games, you have a constant mental battle going on over new releases. Do you take the plunge and buy on launch day? Or do you wait patiently, hoping a review copy will arrive in your mailbox? Patience is not necessarily my strong suit, so when Return to PopoloCrois: A Story of Seasons Fairytale finally hit the eShop, I bought it immediately. I loved PopoloCrois on the PlayStation Portable and couldn't wait to jump back in, so review copy or no, I bought the game. About a week later, I'm fighting the final boss and my phone flashes. Do I want to review PopoloCrois on the 3DS? Of course I do, but it does strike me as bizarre that I'm writing a review for a game I haven't yet received in the mail. As a matter of fact, this review may even be posted before the game arrives! The crazy part? Even though the review copy is free, I don't regret buying it the week prior. Return to PopoloCrois is bursting at the seams with fun and charm, and it's the biggest surprise on 3DS since 2015's excellent strategy RPG Stella Glow. My first instinct, when it comes to Return to PopoloCrois's plot, is to tell you that it has more cookie cutters than the Keebler Elves. Challenge to the throne, unfamiliar lands, amnesia, collect X to do Y, light vs. dark, orphan(s) with lineage secrets... I could go on all day. But as unoriginal as the wireframe of the plot is, the localization and writing make this so much more than another "save the world with friends" JRPG. All six party members have compelling personalities and backstories, and each is more likeable than the last. By the end of the game, Prince Pietro, Rue, GamiGami, White Knight and the rest had entrenched themselves in my good graces. So in a final battle that's a copy from every other JRPG, like, ever, you'll care less that its derivative and more about how your friends are going to make it out alive. Even with the "been there, done that" plot, the characters will be the driving force in seeing the story reach its conclusion. I won't spend much time on the game's presentation as it's pretty middle of the road. The characters and towns all have that cel-shaded look; if you played Fantasy Life, you'll see exactly what I mean even before you start a new save file. There are also a number of fully animated sequences, and these look downright amazing. The sound, on the other hand, has both good and bad aspects. The ability to switch voice tracks (two Japanese and one English) is a godsend for those of us who don't usually go for the English dubs. The music has some catchy tunes as well, but like the graphics, it's all pretty C+ or B- grade. Seeing as Return to PopoloCrois: A Story of Seasons Fairytale is a mash-up of the PopoloCrois series and the Story of Seasons (Harvest Moon) series, you know you'll be getting two main gameplay styles - farming and JRPG turn-based combat. Arguably, the farming is the less important of the two, so we will start there. 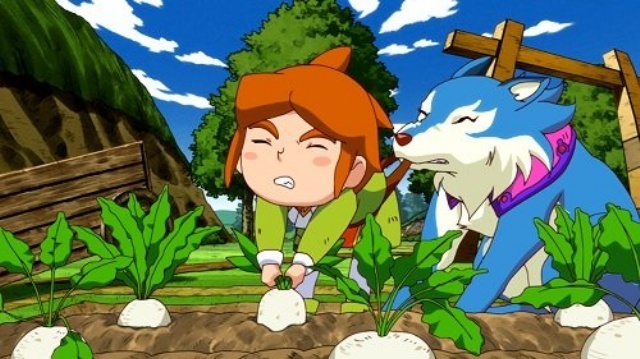 If you aren't familiar with Harvest Moon, Rune Factory or Story of Seasons, farming can be a bit of a shock. No matter what activity you are engaged in, you'll need to make time to tend to your crops and animals. JRPG fans probably won't have much desire to drop everything and go back to a farm to water thirsty plants - at first. Once the cycle gets its hooks in, though, farming can be extremely rewarding. A new farm, each with indigenous plants, is opened every time you complete that region's main dungeon. By the end of the story, you'll have 5-6 separate farms and be constantly juggling what is growing, what needs to be planted and what is ripe enough to collect. The gameplay loop is strong and addictive enough that it won't be uncommon to drop your main goal for extended periods in favor of tending to your many farms. You'll also eventually unlock the ability to keep farm animals, which produce milk, eggs and fur, and bugs and minerals round out the obsessive collector's list of things to do. What is nice about this is that you truly can do as much, or as little, farming as you want while playing through the story. Leaving this as an option rather than a requirement was a brilliant move, as those who don't care to farm can still get through the game regardless. But trust me; once you've got a farm or three, it will be a treat, not a chore, to till the fields and milk the cows. That battle system earns the highest praises for not just the battling itself, but the options it gives you. The only negative is that the game uses random encounters; every few steps an invisible enemy attacks and you are pulled from the field to an arena to do battle. I have always hated this system, but Return to PopoloCrois eases the pain a bit. You can turn on auto-battle, which takes care of everything for you - and with decent AI. Also, you can raise and lower the frequency of these encounters on the fly. If you are grinding, turn the rate up to increase the fights per step, or down if you are exploring a new area and don't feel like being constantly pulled away from what you are doing. After Bravely Default included similar options, I said that there was no going back for the JRPG crowd. Not having both these options is like a Call of Duty without multiplayer; yeah, it still works, but how much fun is it? Not much. Few will deny that the random encounter JRPG has gone stale, but implementing these two options is a big step in making the antiquated and now-borderline-painful system enjoyable again. In addition to the main storyline, you'll also have the option to complete sidequests, which number at about 100 total. A lot of these are "go here, kill this" or "bring me 5 of these," but completionists like myself will want to find and tackle every last one of them. If that is the plan, though, farming and collecting become much more important. But like the farming, these quests are as skippable as you want them to be. In a minor drawback, the menu for the quests is long and counter-intuitive, and it makes figuring out what you've done and haven't a real chore. You can check active quests with a button on the touch screen, but even with that feature it can be tough to plan your next move while constantly flipping through menus. The 3DS has, of late, been the system to get if you like RPGs. Stella Glow, Project X Zone 2, Fire Emblem: Fates, Mario & Luigi: Paper Jam and now Return to PopoloCrois should be enough to sway any RPG fan, and those are just the excellent RPGs released in the last six months or so. Delving further into the back catalogue reveals tons more. And among that lineup of greats, Return to PopoloCrois earns its place. It's charming, light-hearted (mostly), beautiful and well-written. It does so much right that highlighting the minor negatives feels pointless and arbitrary. Even with all the other RPGs on the system, Prince Pietro's latest adventure is one that has something for everyone. 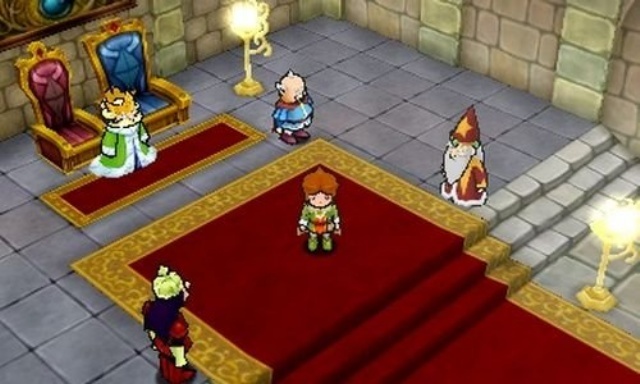 Final Rating: 93% - PopoloCrois keeps the 3DS system's RPG momentum going.